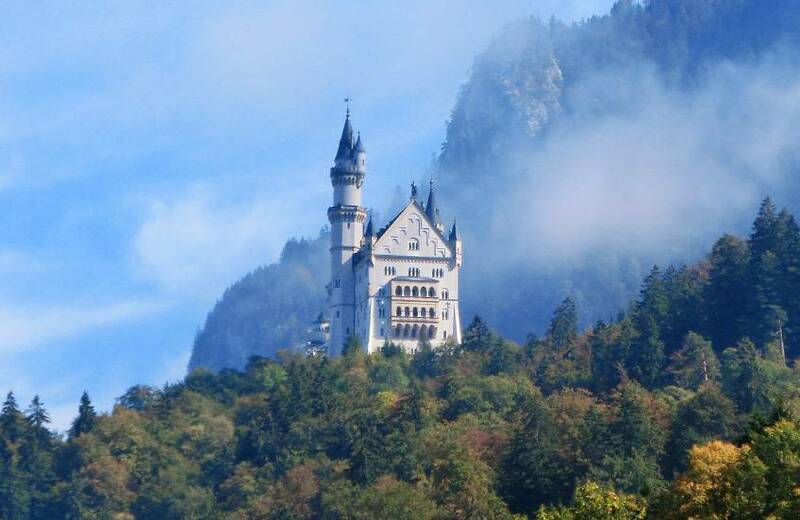 Neuschwanstein Castle was begun by King Ludwig II of Bavaria in 1869 as a complementary “fairy tale castle” to his home in Hohenschwangau. Construction on the unfinished castle ended with his death in 1886. The preparatory work for this "unique project" began in 1868 with the removal of stones for the foundations. The access road to the site was completed in June 1869 using modern materials and techniques. The foundations were cement, the walls were built with brick then covered with a limestone façade and the great throne room was framed in iron girders later wrapped with opulent decoration. Despite the modern construction methods, the many modifications to the plans during the more than two decades of construction meant that Ludwig II, who had refused to pay for the construction project from his personal fortune, was only able to live in the castle for a few months before his death. He was never able to experience the castle in its present splendour. Neuschwanstein, the most famous of Ludwig's castles, brings more than 1.3 million visitors each year and is one of the most well-known sights in all of Germany. This jewel of European historicism built by architect Eduard Riedel according to plans by Christian Jank gives unique insight into the world of Ludwig II and his time.